While there is some optimism surrounding the roll out of 5G networks worldwide in a few years and the first 5G iPhone coming out in 2020, some might say that's just the same story all over again about a 'new and fresh iPhone reboot.' Similar comments, bullish and bearish, can be made about the idea of foldble phones, or any other type of fairly abrupt new featured version of smartphones. Apple has an iPhone user base that nears one billion people even though its growth has slowed. It has turned that user base into a revenue stream from Services. As far as the 'what part of services is working' question, it spans items like payments from Google for search, to App Store, Apple Pay, cloud services, and App Store search ad business. The hardware piece of Apple, though dominated by the iPhone, also includes Mac and the bigger than expected hit that is the Apple Watch. AND THE FUTURE IS?... There are two places where Apple has, finally, said out loud the future is headed. The digital health market is expected to reach $206 billion by 2020, driven particularly by the mobile and wireless health market. 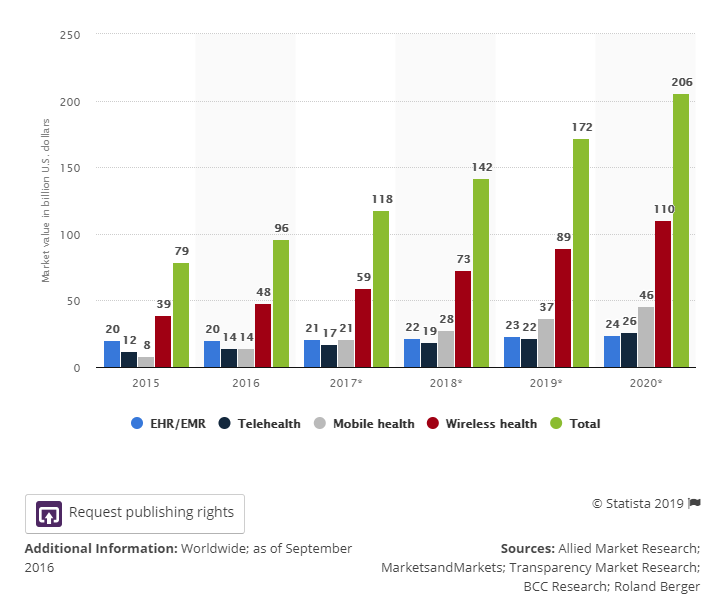 Mobile health is experiencing a growth trend as consumers demand more accessibility to their medical health professionals and transparency in health care becomes more important. Add on that the newest version of the Apple Watch has been cleared by the FDA as a real-time EKG monitor, and we see a hardware and services opportunity with an existing product, and future products, that could get investors excited. This is where the 900 million iPhone users as a base really starts to matter. In September of 08 we wrote Apple's Watch Matters — Of Course it Does. But, it's really impossible to capture the total addressable market (TAM), here. For example, the estimated global healthcare expenditure to treat diabetes in 2017 was $727 billion on its own and there's no doubt that Apple and other firms are still working on the crown jewel of that realm -- a wearable that can measure blood levels without a pin prick. Suffice it to say, healthcare is a massive market. It is more and more becoming consumer driven, and Apple has 900 million people walking around with iPhones in their pockets. It's a good start. The second market Apple is going after is streaming video. We have written extensively about this market and our March 2018 dossier Apple, Finally, Makes a Serious Move into Video, is a good place to start. 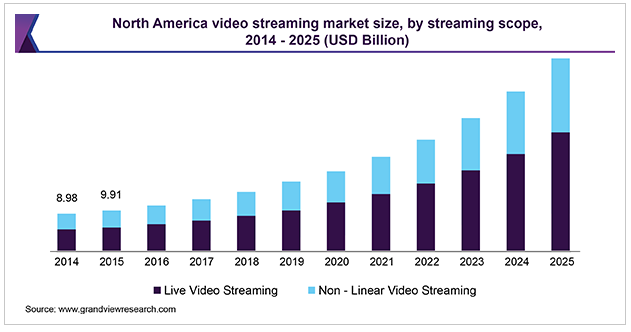 The global video streaming market size was valued at $31.62 billion in 2017 and is anticipated to exhibit a CAGR of 19.10% from 2018 to 2025, reaching well over $100 billion by that time. While there is excitement here, there is also incumbent competition. Apple may need to make an acquisition to move the needle here. Keep in mind, for better and for worse, Apple's business is so large that even a business as large as Netflix wouldn't even hit the 10% level of total revenue. All of this thinking has been rather 'inside the box.' There is a more creative view of the TAM for Apple Services that could move the needle sooner rather than later. If Apple were to bundle its video streaming service with it's Apple Music business and an expansion of its payments and advertising businesses, now we see a fairly unique Service bundle that could land in the $15 / month range. It's easy to do the math here, though it's all made up numbers, but if a third of those 900 million iPhone users end up becoming Apple 'bundlers,' now we could see a $50 billion a year recurring service business on top of the current $40 billion business. That certainly moves the needle. If healthcare is also a part of that bundle with a premium to it -- we could see a truly distinctive business line. That's the bullish thesis - if you have one. It's wrapped up somewhere in these businesses.